We would like to provide you with some important general information about our service line. 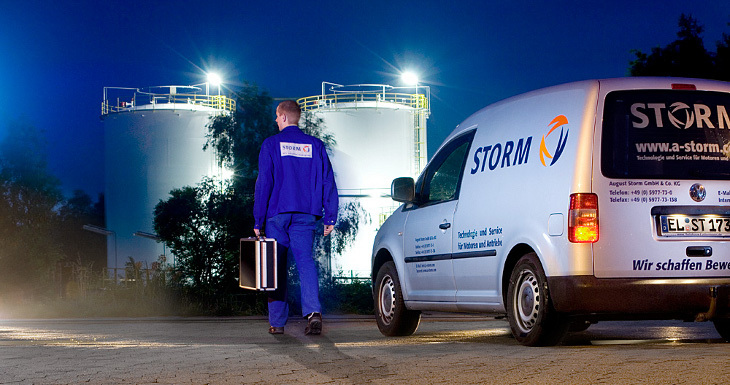 The August Storm GmbH & Co. KG service line is a permanently manned number which allows you, our customers, to report emergency situations promptly and to initiate their resolution as quickly as possible. The duty technician carries out his normal day-to-day work, and takes the service phone with him outside his normal working hours. He is therefore not just responsible for the on-call service. This enables us to also respond to your calls free of charge outside our normal business hours. We regard the 24/7 service line as primarily a consulting service, conceived to provide you with advice and assistance. Our objective, together with you, is to localise technical defects and where possible to correct them directly. In the case of complex technical problems, on-site service effort is planned in coordination with you and is then carried out by one of our service technicians. For better and faster support in emergency situations, we have developed a data sheet containing the most important system data. Please have the completed data sheet, or the information contained in it, available when you call us. Please only use the service line when it’s absolutely necessary. Please only call during rest periods and outside normal working hours when the problem can really not wait until the next morning. Planned dates can not be changed via the service line, since the duty technician does not have access to the day-to-day service schedules. Calls to the service line are initially free of charge for our customers. Advice and assistance by the duty technician, or use of the remote maintenance capability, can result in costs which are invoiced at the current service rates. Such assistance, however, requires less time, and no travel costs are incurred. For delivery of replacement parts or dispatch of a service technician, the currently valid flat-rate charge will be invoiced. The work carried out by the service technicians will also be charged for in accordance with the currently valid service rates. The duty technician will inform you before you incur any costs.